A man once had twelve children and had to work night and day to earn even the most meager sustenance of mere bread for his children. When the thirteenth child was born, he was filled with overwhelming despair. He ran out to a well-traveled road and decided to ask the first person he met to be the child’s godfather. The first person he met was the Dear God himself. God already knew what was troubling the man and said “Poor man, I pity you. I will raise your child from the baptismal font, will care for it and make it happy on earth.” The man replied: “Who are you?” “I am the dear God.” “I don’t want you to be the child’s godfather,” the man said, “you give to the rich and let the poor hunger.” The man said this because he did not know how wisely God distributed riches and poverty. He turned from the Lord and continued on his way. He soon met the devil, who asked him: “Whom are you looking for? If you desire me to be the godfather of your child, I will bestow gold galore and furthermore, grant every worldly desire.” The man asked “Who are you?” “I am the devil.” “I don’t want you to be the child’s godfather,” the man said, “You lie and tempt people.” He continued on his way. Soon dry-boned Death approached him and said: “Take me as the child’s godfather.” The man asked “Who are you?” “I am Death, who makes everyone equal.” The man replied, “You are the right one. You take the rich and poor without distinguishing between them; you shall be the godfather of my child.” Death responded “I will make your child rich and famous. Whoever has me as friend, shall not want.” The man replied: “This Sunday is the baptism. Come at the given time.” Death appeared as promised and stood as proper godfather. Soon thereafter the daughter of the king became seriously ill. She was the king’s only child . He cried day and night until he was blinded by tears. He let it be known that whoever would save his child, would become her husband and inherit the crown. The doctor came to the bed of the patient and saw Death at her feet. He should have remembered the warning of his godfather, but the tremendous beauty of the princess and the thought of becoming her husband filled him with joy and so he turned a deaf ear on all the warnings. He did not notice Death giving him angry looks, raising his hands in anger or threatening him with his bony fist. He raised the ill girl and placed her head were her feet had been. Then he gave her the herb and her life’s force returned immediately. When Death saw that he had been robbed of what rightfully belonged to him, he lunged toward the doctor in long strides and said “It’s over for you! Now it’s your turn.” He grabbed him with his ice-cold hand. His grip was so firm that he could not put up a struggle but had to follow him to his underground cavern. 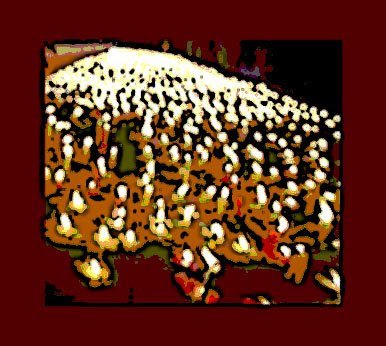 There he saw how thousands upon thousands of lights burned in immense rows. Some of the lights were large, others half the size and still others small. Every moment several went out and others started up again, so that the flames appeared to be in a steady state of change. “You see,” Death said, “these are the life lights of men. The large candles belong to children, the half-size candles belong to married couples in the best years of their life. The small candles belong to old people. But sometimes children and young people also have a very small light.” “Show me my life light,” the doctor said, and thought his must still be quite large. Death pointed to a small stub, that was about to go out. Death said “See, there is your light.” “Oh, dear godfather,” the frightened doctor pleaded, “Light a new candle for me, do it for my sake, so that I can become king and marry the beautiful princess.” “That I cannot do,” Death replied. “First a candle must go out before a new one is lit.” “So take the old one and start a new one immediately so that it starts to burn when the other goes out,” the doctor begged. Death acted as if he wanted to fulfill his wish. He took a long, fresh candle in his bony hands. But because he wanted to take revenge, he slipped while lighting the new candle, the little stub fell over and went out. The doctor immediately fell to the floor and had now fallen into the hands of Death himself.